Beginning in the 1970s, Saddam Hussein ruled the Republic of Iraq with a tight grip. His supporters maintained that through his many social and economic programs he effectively brought the country into the modern age. His many critics, however, claimed that Saddam was a ruthless dictator who would stop at nothing in his endless push for power. Regardless, the charismatic leader retained control of his country during countless military conflicts, including an eight-year war against Iran in the 1980s and the Persian Gulf War in 1991. He also survived a slew of assassination attempts throughout the course of his presidency, and at times he seemed almost invincible. But in March of 2003, U.S.-led forces invaded Iraq and deposed the defiant leader. Saddam escaped capture, but after a nine-month manhunt, he was caught, imprisoned, and faced multiple charges relating to war crimes and human rights abuses. Many speculated that the once-invincible ruler would ultimately face the death penalty. The ex-president of Iraq had a troubled childhood. Saddam Hussein was born on April 28, 1937, in the village of Al-Awja, near Tikrit, a town just north of the city of Baghdad, in central Iraq. His father, Hussein 'Abd al-Majid, was a peasant sheepherder who by various accounts either died or disappeared before his son's birth. His older brother, who was twelve, died of cancer shortly thereafter. The combined tragedies had a devastating effect on Saddam's mother, Subha Tulfah al-Mussallat, who became extremely depressed during her last months of pregnancy. After her new son was born, she named him Saddam, which means "one who confronts" or "the stubborn one." Because of her depression, however, she was unable to care for him, and young Saddam was sent to live in Baghdad with his uncle, Khairallah Talfah, a retired army officer and Arab nationalist. "We are ready to sacrifice our souls, our children, and our families so as not to give up Iraq. We say this so no one will think that America is capable of breaking the will of the Iraqis with its weapons." When he was three years old Saddam returned to live with his mother, but she had remarried and family life was not pleasant. His new stepfather was abusive and treated him harshly over the next several years. As a result, when he was ten years old Saddam ran away to the safety of his uncle's home. Khairallah Talfah served as a role model for his nephew, especially influencing his political beliefs. After Saddam graduated from the al-Karh Secondary School in Baghdad, he officially joined his uncle's political party, the Arab Baa'th Socialist Party, which had been formed in Syria in 1947 with the goal of promoting unity among the various Arab states in the Middle East. In Iraq and neighboring countries the Baa'th Party had become an underground revolutionary force. In 1959, when Saddam was just twenty-two years old, he played a major part in the assassination attempt of Iraqi Prime Minister Abdul Karim Qassim by the Baa'th Party. He was shot in the leg but managed to escape, first to Syria and then to Cairo, Egypt. While in Egypt he studied law at the University of Cairo. In 1963, after a military overthrow of Qassim's government, Saddam was allowed to return to Iraq. That same year he married his first wife, Sajida, the daughter of his mentor, Khairallah Talfah. His return was short-lived, however, since internal squabbling within the new Baa'th regime led to its downfall. Once again Saddam was forced into hiding, but he was caught in 1964 and imprisoned for the next two years. Although in jail, he remained involved in party politics. Escaping from prison in 1966, Saddam became a rising star in the Baa'th organization, forming close ties with key party officials who were planning a second attempt at taking control of Iraq. In July of 1968 the Baa'ths organized a successful takeover of the Iraqi government. Ahmed Hassan al-Bakr, a retired general and prominent party spokesman who was a distant relative of Saddam, assumed the role of chairman of the Baa'th Revolutionary Command Council (RCC) as well as the presidency of Iraq. 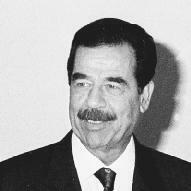 Saddam, who had become an integral part of the organization, was named vice president. Although Ahmed Hassan was officially the president of Iraq from 1969 through 1979, it was Saddam Hussein who truly held the reins. And thanks to Saddam, the country enjoyed its most stable and productive period in recent history. After oil prices soared in the 1970s (oil is Iraq's primary natural resource and export), he used the revenues to institute a major system of economic reform and launched an array of wide-ranging social programs. Roads were paved, hospitals and schools were built, and various types of industry, such as mining, were expanded. In particular, Saddam focused attention on the rural areas, where roughly two-thirds of the population lived. Land was brought under the control of the Iraqi government, which meant that large properties were broken up and parcels distributed to small farmers. Saddam also funneled revenues into modernizing the country's agriculture industry. For example, he brought electricity into even some of the most remote communities. Saddam's social programs benefited both rural and city dwellers. In an effort to wipe out illiteracy, he established free schooling for children through high school and made it a government requirement that all children attend school. Saddam's government also provided free hospitalization to all Iraqis and gave full economic support to families of Iraqi soldiers. Such large-scale social programs were unheard of in any other Middle Eastern country. When he created his massive reforms, Saddam may have had the benefit of his people in mind, but he was also a shrewd politician. In order to maintain a stable government and to assure that his party would remain in power, it was necessary to gather as much support as possible. By the late 1970s the Baa'th regime enjoyed a widespread following among the working classes, and the party was firmly unified around its second-in-command. Saddam also served as the outward face of the Iraqi government, representing the nation on both the domestic and international fronts. On July 22, 1979, when an ailing Ahmed Hassan al-Bakr decided to step down as president, it came as no surprise that Saddam Hussein stepped into his shoes. Support for Saddam Hussein was not universal. The conservative followers of Islam (the national religion of Iraq) did not agree with many of Saddam's innovations, which they felt were directly opposed to Islamic law. This included legislation that gave women more freedoms and the fact that a Western-style legal system had been installed. As a result, Iraq became the only Arab country not ruled by the laws of Islam. Major opposition also came from the Kurds who occupied the northern region of the country. The Kurds are a nomadic people who are concentrated in areas of Turkey, Iran, and Iraq. They are Muslim but not Arabic, and they strongly disagreed with the Baa'thist push for a united Arab front. Tiled portrait of Saddam Hussein in Tikrit, Iraq. Many such images and statues of Hussein appeared in cities throughout Iraq. at least three hundred officers who had supposedly questioned his military tactics. Once in control, Saddam surrounded himself with a tightly-knit group of family and friends who assumed high levels of responsibility within the government. These individuals, however, were not necessarily immune to Saddam's paranoia. At one point, Adnan Talfah, Saddam's brother-in-law and childhood friend, was killed in a "mysterious" helicopter crash. And in 1996 Saddam had his sons-in-law murdered for being disloyal. Although he ruled with an iron fist, Saddam also was preoccupied with winning the devotion of the Iraqi people. He promoted himself as a hero of the nation who was dedicated to making Iraq the leader of the Arab world. 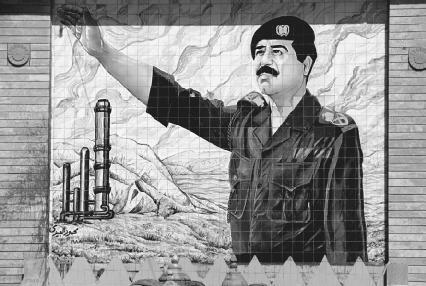 Images of Saddam were plastered throughout the country. Some of them depicted the ruler as a dedicated Muslim wearing traditional robes and headdress; others featured Saddam in a Western-style business suit, wearing sunglasses and holding a rifle over his head. All were efforts to make a connection at every level of society and to solidify his role as an all-powerful president. Such tactics, however, also solidified his reputation as an insecure and unstable leader. He became known for his paranoia, which was not unjustified, considering he had survived at least seven assassination attempts. As a result he rarely appeared in public. He also slept only a few hours a night, at secret locations, and all of his food was carefully prepared and inspected by official food tasters. Outside of Iraq, especially in the West, Saddam was seen as a dictator whose quest for dominance in the Middle East was viewed with particular concern. In 1980 Saddam proved that such fears were founded when he attacked Iran, an invasion that led to an eight-year bloody conflict. Relations between Iran and Iraq had been deteriorating for years, and came to a head in 1979 when the Ayatollah Khomeini (c. 1900–1989) overthrew the government of Iran during an Islamic uprising. Saddam worried that Khomeini would set his sites on spreading his radical religious rule to the secular (nonreligious) state of Iraq. Disputes over territorial boundaries led to skirmishes throughout late 1979 and into 1980, and on September 22, 1980, Iraqi forces crossed the Iranian border and officially declared war. Over the next eight years, both countries suffered almost irreparable damage, and the healthy economy that Saddam had created during the 1970s was in ruins. Billions of dollars were borrowed from countries such as the United States, Kuwait, the U.S.S.R., and France, to support the war effort. The United States alone gave the Iraqi government nearly $40 billion in food supplies and arms. And both sides suffered a tremendous loss of human life. It is estimated that approximately 1.7 million people were killed during the conflict. In one battle on March 16, 1988, Iraqi troops attacked the Kurdish town of Halabja, using poison nerve gas. Nearly five thousand people died, most of whom were women and children. Various reports claimed that chemical weapons were used by both Iran and Iraq, but these tactics continued to raise the alarm that Saddam Hussein was a military threat who could not be trusted. In 1989 the war ended in a stalemate, with no side claiming a real victory. Conflicts between Saddam and other nations, however, were just beginning. Faced with the prospect of rebuilding his country, Saddam tried to pressure the neighboring country of Kuwait to forgive the $30 billion loan he had been given. The reason he gave was that the war with Iran had effectively protected Kuwait from an Iranian invasion. Tensions were also sparked between the two countries over territorial boundaries that were especially important because they involved the control of oil reserves in the area. When negotiations failed, Saddam invaded Kuwait on August 2, 1990. The unprovoked attack was denounced by governments throughout the world, especially the United States. The administration of Ronald Reagan (1911–2004) in the 1980s may have seen Saddam as a potential ally, but after the invasion of Kuwait, President George H. W. Bush (1924–) essentially severed all ties between the United States and Saddam Hussein. As a result, when the Iraqi leader refused to leave Kuwait, a combined force of U.S. and United Nations (UN) troops stepped in. Fighting lasted a mere six weeks, but after the Persian Gulf War came to an end, casualties topped over eighty-five thousand. Saddam was successfully evicted from Kuwait, but the tensions were not over. Bush ordered U.S. troops to protect Kuwaiti borders, and in his March of 1991 State of the Union address he told the American people, "We all realize that our responsibility to be the catalyst for peace in the region does not end with the successful conclusion of this war." He called Saddam a brutal dictator "who will do anything, will use any weapon, will commit any outrage, no matter how many innocents suffer." In an effort to control Saddam, the cease-fire agreement drawn up between the United Nations and Iraq required the country to destroy all of its chemical, nuclear, and biological weapons. The agreement also stipulated that Saddam had to let UN inspectors oversee the efforts. If Iraq did not comply with the agreement, economic sanctions would be imposed, meaning that all trade with the country would be cut off. Throughout the 1990s the Iraqi leader reportedly concealed the manufacture of weapons from inspectors, and the sanctions continued. Cut off from the world, the people of Iraq suffered. Unemployment rose, agricultural production declined, and the majority of the population suffered from severe malnutrition and lack of medical care. There was increased unrest among the many factions in the country, which prompted Saddam to increase his tactics of repression. When George W. Bush became president of the United States in 2001, one of his first acts upon taking office was an attempt to reinstate economic sanctions, which had been lifted by the United Nations in the late 1990s. World opinion opposed the effort as inhumane; the Iraqi people had suffered far too much. Anti-Saddam sentiment only escalated, however, after the terrorist attacks of September 11, 2001. Although the attacks were never linked to Saddam Hussein, Bush insisted that terrorists armed with Iraqi weapons could at any time target the United States. In his State of the Union address in January of 2002, the U.S. president called Iraq part of an "axis of evil," and claimed that the country "continue[d] to flaunt its hostility toward America and to support terror." Time and again Bush publicly accused Saddam of concealing weapons, and by 2002 he threatened to invade Iraq if UN inspectors were not allowed back into the country. Saddam countered that there were no weapons, and opened his doors. Although UN inspectors found nothing, Bush maintained that inspectors had simply not found the well-hidden weapons yet. By early 2003, war with Iraq was looming. In January of 2003 Bush gave Saddam an ultimatum: either totally disarm his country or voluntarily leave Iraq. If neither step was taken, the United States would attack. In February of 2003, in an unprecedented move, Saddam Hussein appeared on television, having agreed to be interviewed by CBS newsman Dan Rather (1931–). The interview was broadcast worldwide, even in Iraq, which meant that the Iraqi people were given a rare glimpse of their reclusive leader who was rarely seen in person. Saddam accused the Bush administration of being part of a "bandwagon of evil," and continued to insist that Iraq did not have concealed weapons and that it had nothing to do with the September 11 attacks. He also explained that he would not leave Iraq and that Iraqis would fight to protect their country if provoked. "We will die here in Iraq," he told Rather. "We will die in this country and we will maintain our honor." Despite massive international opposition, hundreds of thousands of U.S. and British troops stormed Iraq on March 20, 2003. Several air strikes specifically aimed at assassinating Saddam Hussein were unsuccessful, and ground troops pushed through the country, heading toward Baghdad, the capital of Iraq. In early April, just three weeks after the invasion, the Saddam regime was toppled. When Baghdad fell, however, the Iraqi president was nowhere to be found. Saddam managed to elude capture throughout the remainder of the year. Reports of Saddam sightings popped up occasionally, but proved to be false. In addition, audiotapes by the ousted leader were released to Arab television networks. Whether they were truly from Saddam remained in question. High-ranking members of the Iraqi government were caught one by one, but Saddam remained at the top of the most-wanted list. In July of 2003 his two sons and political heirs, Uday and Qusay, were killed by U.S. forces. It was thought that perhaps Saddam's capture would be imminent, but the elusive leader remained on the run for the next five months. Finally, on December 13, 2003, Saddam Hussein was located just nine miles outside of his hometown of Tikrit, hiding in an underground cavern known as a "spider hole." Disheveled and dirty, with a graying beard and matted hair, he surrendered without resisting. According to commander of U.S. forces Lt. Gen. Ricardo Sanchez, as quoted on CNN.com, "He was a tired man. Also, I think, a man resigned to his fate." The deposed leader was taken into custody by U.S. forces and held in Baghdad until June 30, 2004, when he was officially handed over to acting Iraqi government officials. On July 1 he faced his first legal hearing before an Iraqi Special Tribunal. During the twenty-six minute hearing he was charged with multiple crimes, including the 1988 attack on the Kurdish village of Halabja, the 1991 invasion of Kuwait, and the killings of political and religious leaders during his thirty years in command. Throughout the accusations Saddam remained defiant, claiming that the tribunal was a farce. He also maintained that he was still the true leader of Iraq. "I am Saddam Hussein al-Majid, the President of the Republic of Iraq," he announced, as quoted in England's Guardian. "I am still the president of the republic and the occupation cannot take that away." Following the hearing Saddam remained in custody, where he reportedly spent time writing poetry, reading the Koran (the sacred writings of Islam), and tending to a small garden within the walls of his Baghdad prison. There were also reports that the sixty-seven-year-old former president was in poor health and that perhaps he had suffered a stroke. Such reports were denied by doctors. It seemed that Saddam would be well enough to face his accusers in a trial set to begin in January of 2005. Many speculated on the trial's outcome, but people in Iraq voiced their clear expectations. Shortly after U.S. forces turned Saddam Hussein over to Iraqi officials, the Iraqi government reinstated the death penalty, which had been temporarily suspended under U.S. occupation. Hamid al-Bayati, the deputy foreign minister of Iraq, was quoted in the Guardian as saying, "Everyone who lost loved ones to Saddam will want to see this." "Saddam Hussein." In Encyclopedia of World Biography. 2nd ed. Detroit, MI: Gale Research, 1998. McCallester, Matthew. "A Day in the Life of Saddam Hussein." Indian Express (July 27, 2004). http://www.indianexpress.com/full_story.php?content_id=51826 (accessed on August 3, 2004). McCarthy, Rory. "I am Saddam Hussein, the President of Iraq." Guardian (England) (July 2, 2004). http://www.guardian.co.uk/international/story/0,,1252291,00.html (accessed on August 3, 2004). "President George H. W. Bush's Address Before a Joint Session of the Congress on the State of the Union, January 29, 1991." CSPAN. http://www.c-span.org/executive/transcript.asp?cat=current_event&code=bush_admin&year=1991 (accessed on Augst 3, 2004). "President George W. Bush's State of the Union Address to the Joint Session of Congress, January 29, 2002." CSPAN Web site. http://www.c-span.org/executive/transcript.asp?cat=current_event&code=bush_admin&year=2002 (accessed on August 3, 2003). Rather, Dan. "Interview with Saddam Hussein." CBS News (February 24, 2003). http://www.cbsnews.com/stories/2003/02/24/eveningnews/main541817.shtml (accessed on August 3, 2004). "The Rise and Fall of a Dictator." CNN.com: World (December 14, 2003). http://www.cnn.com/2003/WORLD/meast/12/14/sprj.irq.saddam.profile/index.html (accessed on August 2, 2004). "Saddam Caught Like a Rat in a Hole." CNN.com: World (December 15, 2003). http://www.cnn.com/2003/WORLD/meast/12/14/sprj.irq.saddam.operation (accessed on August 2, 2003).